I guess those rumored plans to dissolve the Ultimate Fighting Championship (UFC) Flyweight division were just that, as the promotion has booked what seems to be a title eliminator fight for the upcoming UFC on ESPN 4 event on June 29, 2019 in Minneapolis, Minnesota. 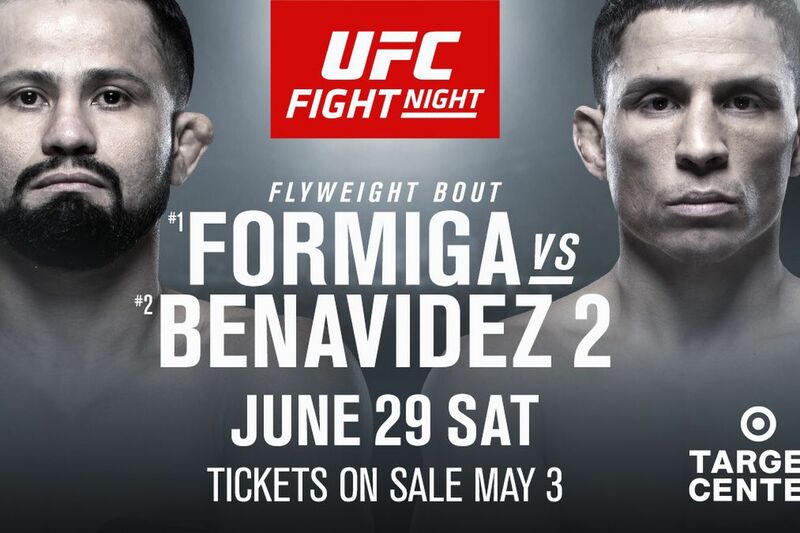 UFC announced the booking of a rematch between former title contender Joseph Benavidez and Jussier Formiga to go down at the ESPN-televised event this summer. Benavidez initially defeated Jussier via first round knockout way back in 2013 in what was Formiga’s third bout with the promotion. Since then, their respective careers have taken different paths, with Jussier going 8-2, while Joseph has gone on to compete for the 125-pound title on two separate occasions, coming up short both times to former champion Demetrious Johnson. Since his last loss to “Mighty Mouse,” Benavidez has gone 8-1 including scoring a win over current champion Henry Cejudo. Had it not been for a close split-decision loss to Sergio Pettis, Benavidez would be riding a nine-fight win streak. Still, his current run is good enough to put him at the No. 2 spot in the world, right behind Jussier. As for Formiga, he has won four straight and was last seen handing top prospect Deiveson Figueiredo his first loss in MMA at UFC Fight Night 146 last month (recap). The winner of this matchup will secure himself a shot at the division strap currently in the hands of Cejudo, who will face off against Marlon Moraes for the vacant bantamweight title at UFC 238 on June 8. UFC on ESPN 4 is set to be headlined by a Welterweight rematch between former champions Tyron Woodley and Robbie Lawler.